Iran’s nuclear program was reactivated by the early 1990s, probably to ensure that Iran would never be as defenceless again as the country had been during its war with Iraq (1980-1988). At that time, the regime of Saddam Hussein had used non-conventional weapons (chemical, biological) on a large scale against the Iranian armed forces and had threatened to use these against major densely populated areas in Iran as well. Over the years the program has turned into an issue of national pride. Nevertheless, taking into consideration the time that has passed (and the fact that the American nuclear Manhattan Project during World War II only required three years from inception to the day when the first bomb was tested) progress has been surprisingly slow. Whether this is due to technical problems or other factors is not known. The International Atomic Energy Agency (IAEA) has been closely monitoring Iran, against which Western countries have ordered sanctions. The tension escalated in February 2006, when the IAEA as a whole reported Iran to the UN Security Council. In October 2009, Iran agreed to send enriched uranium to Russia. In June 2011, former Iranian President Ahmadinejad announced that his country would continue to enrich uranium. Debate over Iran’s nuclear program remains the focal point in relations between Iran and the US and its European allies. 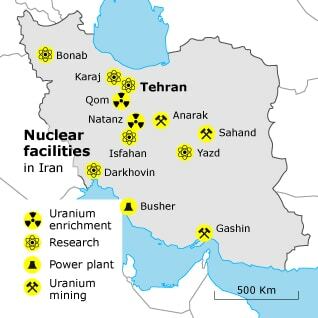 Fanack offers a special file on Iran’s and other Nuclear Programs in the region.